7.2 Grades of thumb sprains. Skier's thumb is a acute partial or complete rupture of the ulnar collateral ligament (UCL) of the thumb’s metacarpophalangeal joint (MCPJ) due to a hyperabduction trauma of the thumb. Whilst both terms are often used interchangeably, skier’s thumb refers to the cause being acute injury. Gamekeeper’s thumb specifically refers to the cause being chronic injury to the UCL in which it became attenuated through repetitive stress. UCL damage caused by Chronic injury may have a serious risk of disabling instability, pinch strength, and pain-free motion if not treated adequately . In 64–87% of total UCL tears, Stener lesion can occur. A Stener lesion occurs when the adductor aponeurosis becomes interposed between the ruptured UCL and its site of insertion at the base of the proximal phalanx. Hence making it impossible for the loosened ligament to reconnect with the site of insertion, necessitating surgery. The metacarpophalangeal joint of the thumb is a diarthrodial joint, reinforced by a capsule and by other soft tissue structures. The surrounding soft tissue offers both dynamic and static stability. The UCL and RCL arise from the medial and lateral tubercles of the metacarpal condyles and insert into the base of the proximal phalanx on their respective sides, beneath the adductor aponeurosis (Figure 1b). The UCL prevents the thumb from pointing too far away from the hand. An acute UCL injury occurs following a sudden, hyperabduction and hyperextension forces at the MCP joint, whereas a forced adduction movement would cause injury to the RCL (Figure 2A). With regards to skiing, the injury often occurs when a person lands on an outstretched hand while holding a ski pole, which causes forced abduction of the thumb with extension (Figure 2B). It is called skier’s thumb but can also occur in football, handball, basketball, rugby, soccer and even a handshake. If the injury to the UCL is not treated properly this can lead to chronic laxity, joint instability, pain, weakness and arthritis in the MCPJ. An often-encountered problem. It concerns 86% of all injuries to the base of the thumb. This type of injury is also seen in other sports, especially those that use a stick or ball, such as hockey or basketball. 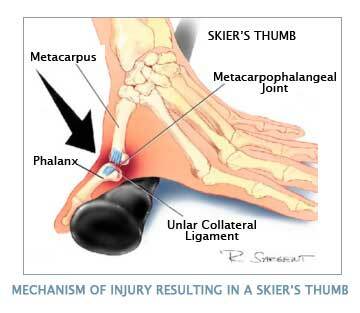 Only an estimated 10% of the patients diagnosed with a skier’s thumb had acquired this injury skiing. A fall on the hand, usually from a bicycle or motorcycle (in which the thumb gets stuck behind the handlebars), is a much more common cause of skier’s thumb, seen in approximately 40 % of all patients(figure 2B). Other sports such as soccer or fighting are responsible for another estimated 30% of the causes(figure 2A). Figure 2A. Mechanism of injury by falling. Figure 2B. Mechanism of injury by skiing. The most common presentation is pain over the ulnar aspect of the MCPJ of the thumb. If the injury is acute there will be bruising and inflammation (Figure 4). There may be tenderness with palpation, which localizes the injury to the ulnar aspect of the thumb where the UCL is lesioned. In more chronic cases the patients typically complain of pain and weakness when using a pincer grip. There also can be instability of the thumb while doing these tasks. In the instance of a Stener lesion, there may also be a palpable mass proximal to the adductor aponeurosis. Pain at the base of the thumb in the web space between thumb and index finger. Inability to grasp or weakness of grasp between your thumb and index finger. Tenderness to the touch along the index finger side of your thumb. Blue or black discoloration of the skin over the thumb. Thumb pain that worsens with movement in any or all directions. Pain in the wrist (which may be referred pain from your thumb). Grade 2: Ligaments are partially torn (less than 3mm) . This injury may require wearing a splint or a cast for 5 to 6 weeks. Grade 3: Ligaments are completely torn or more than 3mm. This is a severe injury that usually requires surgery. Grade 4: Failed immobilization and required surgery as did all of those with a Stener lesion. Figure 4. Presentation of an ulnar collateral ligament injury with an avulsion fracture. Photo courtesy H. Stevenson. The injury can involve other structures such as the adductor aponeurosis, the accessory collateral ligament, bony structures, tendons and neurological tissues. The injuries all present with pincer grasp weakness. However they may be differentiated by the location of tenderness. For al thumb injuries, radiographs should be obtained of the patient suspected to have a skier’s thumb. It’s important to remember that a skier’s thumb may or may not be visible on X-ray and the most common radiographic finding is an avulsion fracture of the proximal thumb phalanx at the site of UCL attachment. MRI can be usefull because it has the highest spicificity and sensivisity. Stener lesion: is a particular type of UCL injury with palmar subluxation of the base of the proximal phalanx. Bennett or Rolando fracture: Is an intra-acticular fracture luxation at the base of MC I in the CMC joint. Neuropraxia of the radial nerve arises secondary to traction, swelling or stiffness. Displaced lesions ( Stener lesions ) cannot be treated conservatively due to impaired healing and require surgical intervention in order to achieve full recovery. Anteroposterior and lateral X-ray films of the thumb are taken to rule out any associated bony injuries. Associated bony avulsion fractures are seen in 20%–30% of UCL ruptures. The position of an avulsed bony fragment usually indicates the position of the distal end of the UCL. Indications for surgical treatment based on imaging include avulsion fractures with displacement of greater than 5 mm or any fracture involving 25% or more of the MCP joint surface . Stress X-ray films of the thumb MCP joint have also been used for diagnosis. Local anaesthetic infiltration increases the accuracy of assessment of ulnar collateral ligament injuries RCT. Ultrasound (US) is an excellent and cost-effective modality for diagnosing UCL tears because it allows direct visualization of the entire UCL and surrounding structures. It locates the torn end of the UCL in almost 90% of cases. The diagnosis should be done by US before conservative therapy is performed with a glove spica cast. There are some limitations when applying, for example the ultrasound cannot be performed later than 1 week after the initial trauma because shrinking of the torn ligament and scar tissue can be confounding when making a diagnosis. The sensitivity of US was 95.4% with a specificity of 80% for detection of Stener lesions. US, with the use of this specific dynamic maneuver is a reliable and reproducible tool for detecting Stener lesions. If the UCL is ruptured there is a possibility that the distal end may become interposed by the adductor aponeurosis, which is referred to as a Stener lesion (Figure 5). A Stener lesion is difficult to diagnose but leads to poor healing and usually indicates operative management. If left untreated, a torn UCL can lead to joint instability and a weak pinch grip. Bring MCP joint in flexion of at least 25°. Figure 6. Valgus stress to UCL - compare stability in injured thumb to uninjured thumb. An injury that is not managed properly can lead to chronic instability of the MCPJ. Operative management depends on a timely diagnosis of the injury; chronic lesions become more difficult to repair with increased time since injury since remaining tissue becomes attenuated not robust enough to provide adequate support to the joint. There are multiple methods of repair, which can be categorized into dynamic or static. Provided surgery has been performed timely ( quality of results drops when surgery is delayed, good results can still be achieved after 3–4 weeks. A period of usually 6 weeks of immobilization is applied, after which a new radiograph is made and physical therapy of the hand can be started. When the pain has subsided and the range of motion has completely returned, the hand can be used again to full effect. Usually this takes about 3 months Patients with worse outcomes are mostly patients with a delay in presentation. When repaired in a timely manner, complications are rare. Not enough information is available on the chances for recurrence with this type of injury. Also, no trials have even been set up to investigate whether a surgical intervention is really superior to a non-surgical treatment. The treatment of skier’s thumb is different for partial and a complete ruptures. Partial ruptures are treated conservatively. The MCP joint is immobilized, with the MCP fixed and the IP joint remaining free to prevent unnecessary stiffness. A navicular cast or brace is usually used. Swelling can be controlled with elevation while supine and the use of cold compresses as needed. The primary goal of rehabilitation is enhancing the patients' function and reducing the time of functional recovery, the reported treatment presents potential advantages in the management of this frequent acute hand injury. Partial UCL injuries like ligament strains, partial tears, low-demand patients and poor-operative candidates, including patients with degenerative MCP joint disease are effectively treated conservatively. Controversy also exists about treating a bony skier’s thumb without surgery. The literature however shows that if the MCP joint is stable during testing and there is no dislocation of the fragment, this injury can be treated conservatively without reason for concern. Less than 15 degrees difference between sides and no signs of avulsion fracture on radiographs. Thermoplastic splint:allows for the patient to begin movement of the interphalangeal joint. 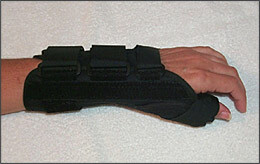 Wearing a splint will avoid putting radial stress on the thumb and gives the ligament time to heal. The optimal positioning for the splint involves holding the MCPJ in slight flexion with a slight ulnar deviation; the interphalangeal joints should not be immobilized in the splint. Figure 7. Thumb spica splint. After the period of immobilization is over, the therapy can be started. Most likely the patient will perform exercises that help strengthen and stretch the joint in order to regain full function in your thumb. 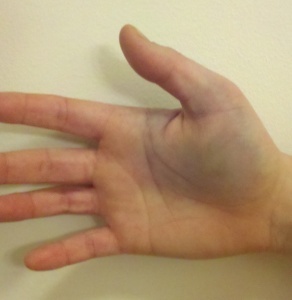 (11) The patient should begin supervised hand therapy during the period of immobilization. Gentle flexion and extension range of motion exercises can begin after about four weeks, with the patient continuing to wear the splint between therapy sessions. After 8 weeks progressive strengthening exercises may begin, but unrestricted activity is not allowed until after 12 weeks. Gripping and pinching activities should not started until 10-12 weeks and should be advanced as tolerated; forceful gripping activities are typically not tolerated until about week 12. When the pain has subsided and the range of motion has completely returned, the hand can be completely used again. Usually this takes about 3 months. Thumb strengthening: Pick up small objects, such as paper clips, pencils, and coins, using your thumb and each of your other fingers, one at a time. Practice this exercise for about 5 minutes. Skier’s thumb, also known as gamekeepers thumb, is an injury to the metacarpal phalangeal joint of the thumb. It can occur to the medial side of the thumb, but this is rare. The chance of an medial side injury is as small as 10-30%. 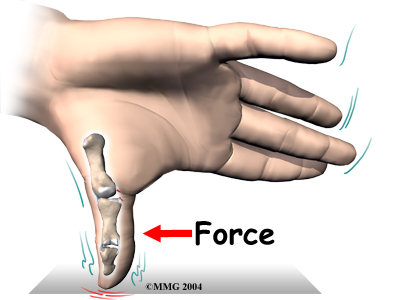 When there is abnormal movement like hyperabduction of the thumb or a sudden force on the thumb then the ligament can rupture (with or without an avulsion fracture). We diagnose an UCL rupture mostly with an ultrasound, which is the most reliable and not costly. We can also palpate an rupture by doing the stress test. UCL rupture can be treated with an operation but this depends on different factors(see medical management). When an operation is needed, the treatment will likely be decided by the surgeon. This will also depend on some factors but most surgeons have a favourite treatment in the wide variety of operations. Partial tears and strains are mostly not treated with an operation. It comes first with the immobilization of the MCP joint to give some rest and so that the body can recover. After that, the patients starts wearing a splint and gets six weeks of therapy sessions (this also includes for post-operative treatments). Where in the mobility and strength get back to the normal values compared with the contralateral thumb. ↑ 1.0 1.1 Ritting AW, Baldwin PC, Rodner CM. Ulnar collateral ligament injury of the thumb metacarpophalangeal joint. Clinical Journal of Sport Medicine. 2010 Mar 1;20(2):106-12. ↑ 16.0 16.1 ChuterG.S.J. Ulnar collateral ligament injuries of the thumb: 10 years of surgical experience. Injury. June 2009;vol40:6:652-656. ↑ Zeigler T. Thumb sprain also known as “skier’s thumb” or “gamekeeper’s thumb”. www.sportsmd.com/Articles/tabid/1010/id/50/Default.aspx?n=thumb_sprain_also_known_as_skier%E2%80%99s_thumb_or_gamekeeper%E2%80%99s_thumb (accessed 13 March 2011). ↑ Manhattan Orthopedic and Sports Medicine Group. Skier's thumb. manhattanorthopedic.com/2011/01/skier%E2%80%99s-thumb/ (accessed 13 March 2011). ↑ 35.0 35.1 35.2 35.3 35.4 Rettig A et al. Anatomic reconstruction of thumb metacarpophalangeal joint ulnar collateral ligament using an interference screw docking technique. Tech Hand Up Extrem Surg. 2009;13(1):7-10. ↑ 39.0 39.1 Rocchi L, et al. A modified spica-splint in postoperative early-motion management of skier’s thumb lesion: a randomized clinical trial.